Strong gains from the Fund’s European holdings and a dearth of losses led to an outstanding year of returns. 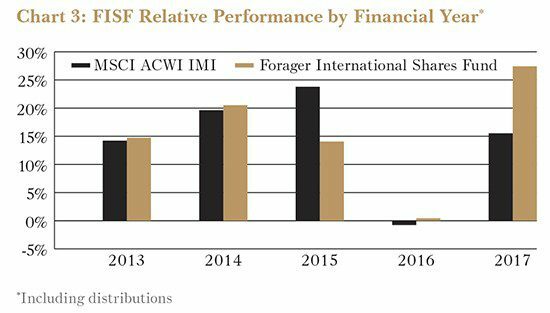 The Forager International Shares Fund returned 27.4%, net of fees, over the year ended 30 June 2017. It’s an excellent result, and one that clearly beat the market’s 15.5% total return. The Fund has generated positive returns in each financial year (although only just in 2016), and provided total unit holder returns of 17.3% p.a. since inception in February 2013, pipping the 16.3% return from the index. The global bull market might be getting a little long in the tooth. Despite continuing the hunt, good ideas are getting harder to find and are more likely to be found in cyclical, lower quality businesses. We’ll take those, but don’t want them to dominate the portfolio. As at 30 June, the Fund’s cash balance stood at 30.5% while we continue the search for higher quality opportunities. It might seem strange to complain after the year that was, but we hate markets that ascend smoothly and consistently. We much prefer yin and yang over time, and look forward to a bit more pessimism in future. Past performance is no guarantee of future results, goes the standard disclaimer. One thing we can guarantee is that we’ll rarely, if ever, have a year as devoid of loss-making investments as 2016/17. That you can bank on. 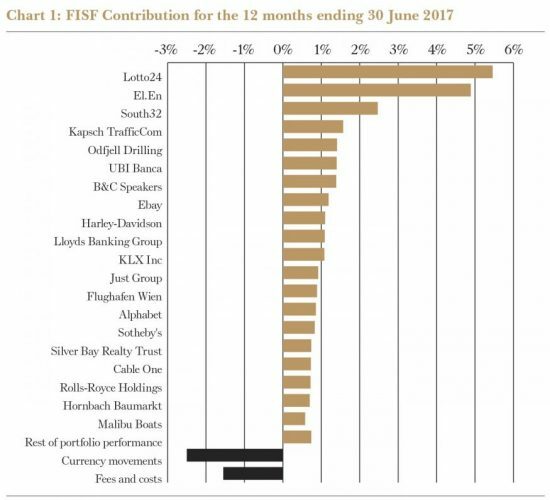 The Fund owned a few small positions that lost value over 2016/17, but none of which deducted more than 0.5% from overall performance. 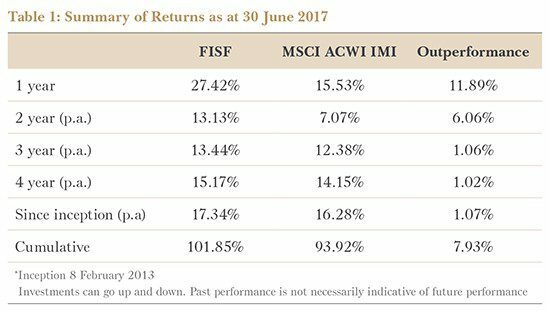 In contrast, 20 individual stocks generated positive returns of more than 0.5%, of which 11 achieved more than 1.0%. One of those added more than 5.0% to overall results. It’s been an astonishingly lopsided year. That begs the question – how much of this is indicative of a bull market that is unbalanced and unhealthy and how much can be put down to a bit of skill on the part of our investment team? Well we do think markets are being rigged, supported by the so-called Yellen/Draghi put (every time the market looks like dipping, the world’s central bankers come to the rescue with extra liquidity). But it’s not that rigged. Over the 2016/17 year, 23% of the 2,827 stocks in the FTSE All World Index provided negative total returns. So it has undoubtedly been a good year. Just don’t expect a repeat. 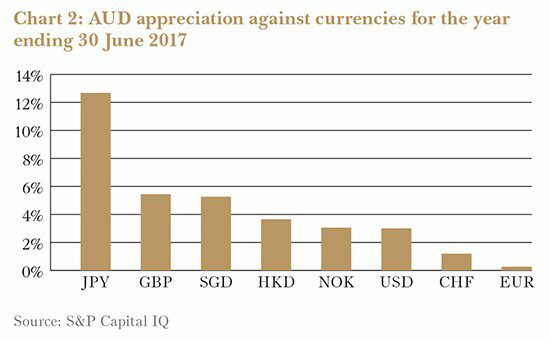 In terms of currency effects, the Australian dollar appreciated against all the major currencies that the Fund has exposure to. In particular, the Aussie dollar rose more than 12% against the Japanese Yen. The net effect of the currency appreciation was to act as a headwind, reducing the Fund’s returns by approximately 2.5%. Lotto24 AG (DB:LO24) was the biggest single contributor to the Fund’s performance. The German online lotto ticket reseller was the Fund’s largest position at the start of the year and the stock more than doubled over the following 12 months, adding 5.5% to performance. Operationally, everything has been going well and management is doing a great job executing on the company’s opportunities. But the underlying intrinsic value of the stock certainly didn’t double last year. When we first bought the stock in 2014, we did so on a thesis that it was worth multiples of our purchase price. That was based on the future profitability we could see coming from this growing business. Reality has performed almost precisely as hoped, with a few small (pleasant) deviations along the way. In the 2016/17 year the broader stock market caught up with that reality. The Fund has been selling down its stake but it remains the second largest position. the start of the year and it too more than doubled over the year and added 4.9% to Fund performance. The story is not dissimilar from Lotto24 – results have been good, better than our original projections. But much of the gain has come from the quick realisation of the margin of safety available on purchase in early 2016. The Fund continues to hold a small position but has realised much of the profits already. We first bought South32 (ASX:S32) in mid-2015 and doubled down in the panicky market of early 2016 at prices below $1. The Fund sold a fair bit of that holding prior to the start of the 2016/17 financial year, but held enough for long enough for it to be a meaningful contributor this year, adding 2.5% to Fund results. We’ve sold out of the stock early in the 2016/17 year. Austrian tolling technology company Kapsch TrafficCom AG (WBAG:KTCG) is up almost 40% over the year and, including dividends, has added 1.6% to Fund performance. In a common theme, the Fund has been selling down the position as the stock trades closer to our estimate of fair value. Outside of the biggest contributors, one matter worthy of highlighting is the contribution from US stocks. We’ve had a very high strike rate of success in the US, likely indicative of a bull market. But no stock has generated multiples of our initial investment, standing it in contrast to our experience in Europe. Perhaps it’s indicative of a more efficient market in the US, and/or highlights the depths of the pessimism in Europe until recently. There haven’t been any multi-baggers in the US but the small wins have added up meaningfully. Harley-Davidson (NYSE:HOG) and eBay (NasdaqGS:EBAY) both contributed more than 1.0% to Fund performance this year, with Sotheby’s (NYSE:BID), Cable One (NYSE:CABO) and Silver Bay Realty Trust Corp. all just under 1.0%. These positions have all been sold over the year as they approached our estimate of fair value. Our thesis with eBay was the earnings power of the company’s valuable e-commerce platforms had been neglected by the former management team more enamoured with then-sister company, PayPal Holdings (Nasdaq:PYPL). Post spinoff, the new management team made strides in fixing some of the company’s deficiencies, but there remained some concerns. The Fund sold after the stock had climbed 37.1% during the year. When competitive pressures drove down the share price of Harley Davidson a few years back, we bought into the iconic motorcycle company and waited for conditions to normalise. While Harley has recaptured some of its lost market share and introduced some exciting new products, conditions remain difficult. A 19.3% increase in the stock price during the year gave us a chance to exit. Cable television and broadband provider Cable One Inc. continues to diligently execute on its strategy to focus on internet services and methodically grow profits. But the mergers and acquisitions market for cable companies in the U.S. has heated up. With Cable One’s stock price climbing 39.0% during the year, it no longer looked compelling value and we took profits. We bought auction house Sotheby’s in January 2016 after its share price halved during a bout of irrational competition with duopoly competitor Christie’s. Our investment was backed by a lot of hard assets. Sanity prevailed quickly and we sold this year for a 65% gain, a good proportion of which happened in the first few months of 2016/17. A good result, to be sure, but the sale was too soon and the stock has continued powering on without our involvement. Silver Bay Realty Trust Corp. owns a portfolio of single family homes in fast growing American cities. With a unique set of tailwinds, we thought those homes were under priced in the company’s books. And the Fund was able to pick up shares early in the financial year at a ~25% discount to net asset value. We’d like to have held this stock for five years as the thesis played out. But the board had other plans and sold out to Canadian company Tricon for a 28% premium to the Fund’s average purchase price. Two other US stocks which still sit in the portfolio—KLX (NasdaqGS:KLXI), Alphabet (NasdaqGS:GOOGL)—both added around 1.0% each to returns. Across the Pond, Odfjell Drilling (OB:ODL), B&C Speakers (BIT:BEC), Lloyds Banking Group (LSE:LLOY) and Just Group plc (LSE:JUST) did likewise. We no longer own Odfjell. As you can see, there’s been a lot of profit taking over the course of the year, which explains the unusually large distribution this year and the high cash balance today. May we heap such problems on you again in future. But, as already pointed out, past performance is no guarantee of future results and the past year has been rather exceptional. 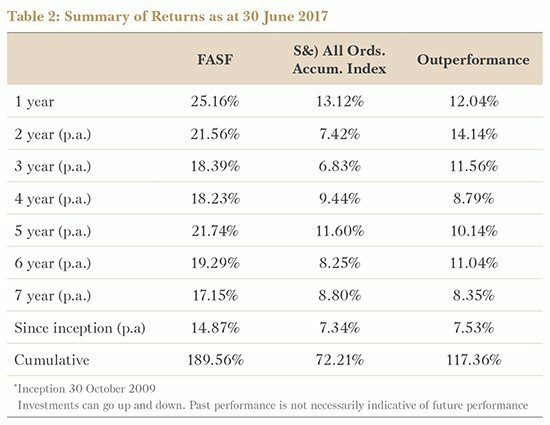 It has been another stellar year for the Forager Australian Shares Fund, the sixth consecutive of outperformance. This year mining services came to the fore. With a return of 25.2%, net of all fees, it was another excellent year for the Forager Australian Shares Fund. The last negative return came in the 2010 financial year. Returns have been in excess of the market for each of the last six years and the five-year return remains north of 20% p.a. Early investors that have reinvested distributions are reaping the power of compounding, with $100,000 invested at inception in 2009 being worth $289,561 at 30 June 2017 (ignoring taxes). Last year smaller stocks were big winners: the Small Ordinaries Accumulation Index outperformed the All Ordinaries Accumulation Index by a substantial 12%. Not that it was featured in many fund managers’ reports, but any investor with the flexibility to own smaller stocks had a huge relative tailwind compared with someone forced to own the underperforming banks and large resources companies. The tailwind in 2016 became a headwind in 2017 as the same small cap index underperformed by 6%. 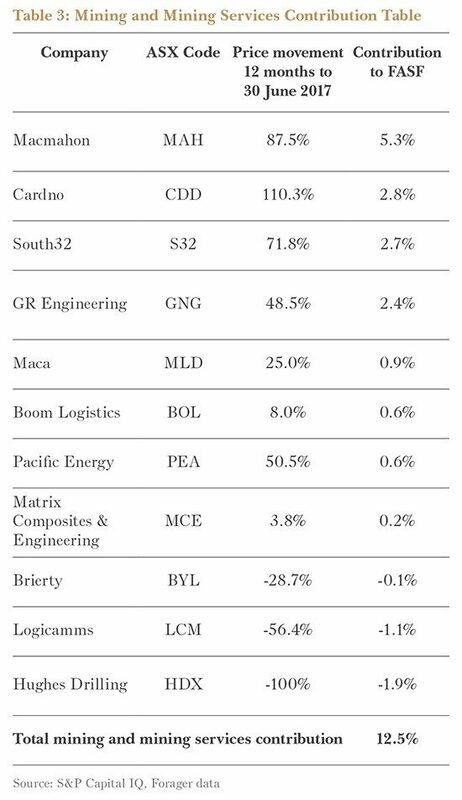 Small stocks underperformed large ones while resources-related stocks outperformed industrials. Into some fairly strong headwinds for smaller companies, then, our outperformance in 2017 was more praiseworthy than that of the previous year. “Ride your winners and sell your losers” is one of many stock market sayings that are not particularly useful. Were it true, RNY Property Trust would have been one of 2016’s best performers rather than the worst. And Macmahon Holdings, one of the Fund’s best performers for two years running, would have been sold long ago. Proponents of the idea will find plenty of evidence in our 2017 performance report, though. The top three contributors to performance were all in the top five from last year’s report. And the worst four performers this year were all in the dog house in 2016. Let’s start with the losers that kept on losing. Despite its unit price falling a whopping 57% the previous financial year, RNY Property Trust (RNY) managed to take the gong for worst contribution again in 2017. The unit price fell a further 59% between 30 June last year and our fortuitous exit in February, knocking 2.7% off the Fund’s return for the year. Charlie Munger once referred to the valuations of some insurance company assets as “good until reached for”. So it has been with RNY. The Trust’s net tangible assets – $0.56 per unit as at 30 June 2015 – evaporated as soon as the properties were put up for sale. Located in suburban areas of the New York tri-state area, RNY’s properties have proven unappealing as tenants migrate to the boroughs and to alternate offices with easy access to public transport. Combined with high operating and financial leverage, property values have been decimated. Management is now anticipating net proceeds to unit holders of between $0.04 and $0.10 per security, suggesting the previous estimates were wildly optimistic. Some investors are understandably irate at both the trust’s manager, RXR Realty, and valuers CBRE who are responsible for verifying the asset values. We are irate at ourselves. It is our job to know when balance sheet values are overstating reality and not taking money off the table when the unit price was north of $0.30 was clearly a mistake. The other stock sharing the dog-house with RNY is Hughes Drilling. The risks section of our research into Hughes was unfortunately prescient. A lack of cashflow and a growing debt pile were highlighted as potentially existential risks. You may rightfully question why we invested in a stock where such risks had been identified. The answer was that, given he had tens of millions of dollars on the line, we thought founder Bob Hughes would come to his senses and temper his reckless expansion plans. Instead he doubled down and doubled down again, with two acquisitions and tens of millions of dollars of expenditure on new equipment. In September 2016 the directors declared the company insolvent and shareholders are unlikely to see anything from the wind-up. Rereading the initial investment case, we would probably make the decision to invest again. We knew fairly early on that Bob wasn’t going to see the error of his ways, though, and still bought more shares as the share price fell. The mistake here was not that we lost money, but that we lost more than we should have. Most of the damage was done the previous financial year but Hughes subtracted a further 1.9% from returns in 2017. Logicamms (LCM) could join Hughes in the listed-company graveyard if management don’t rectify its woeful performance in a hurry. The share price fell another 56% in 2017 as its financial performance fell well short of management forecasts and that same management team jumped ship. While the engineering services company doesn’t currently have much debt, Logicamms isn’t making money either. After a number of capital raisings in recent years it is hard to see shareholders throwing more good money after bad. At less than a 1% portfolio weighting, failure won’t be catastrophic for the portfolio but the stock lopped 0.9% off 2017’s return and we are seriously concerned about its future. The final negative contributor of note was financial services software company GBST (GBT), which reduced the Fund return by 1% thanks to a 28% share price fall. GBST, too, was one of last year’s worst performers. That was largely outside the company’s control as Brexit cut the Australian dollar value of its UK revenues (roughly half GBST’s revenues are generated in pounds). This year its wounds were self-inflicted. Founder and managing director Stephen Lake sold shares prior to a downgrade and then resigned. After his departure new management announced that it had been under-investing in recent years and that the next few years’ profits are going to be severely curtailed by the costs of catching up to the competition. With sticky customers and plenty of cash in the bank, GBST’s future is secure. There is work to be done to make it a prosperous one. So to the winners’ circle where we once again find some familiar names. 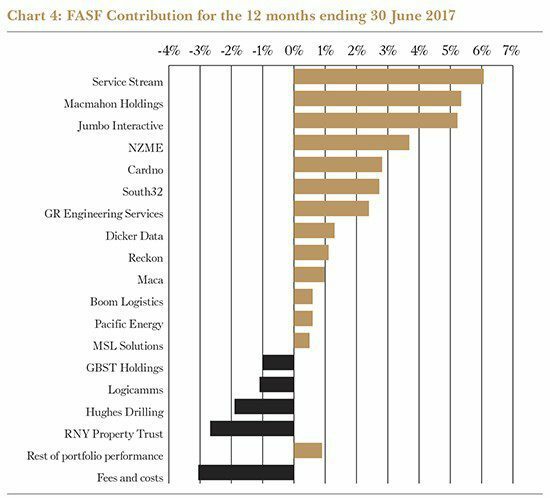 Service Stream (SSM) was the largest single contributor to fund performance again. Including dividends the stock returned 72% over the course of the year and single-handedly added 6.1% to Fund performance. That’s on top of the 12.3% contributed the prior year and firmly cements the stock as our most successful investment ever. Well managed acceleration of work related to the rollout of the NBN led to multiple upgrades throughout the year and it now looks like making a profit of $28 million after tax for the 2017 financial year. Compare that to the less than $50m market cap of 2013 and you can see why the share price has rocketed. Service Steam has a few years’ growth ahead of it yet but that is now reflected in the price. It is currently at its lowest weighting in years and is unlikely to be top of the list in 2018. With a 111% total return over the year, online lottery ticket reseller Jumbo Interactive (JIN) contributed almost as much to Fund performance as Service Stream. Despite a poor year of lottery jackpots impacting on sales, corporate activity saw the underlying value of Jumbo’s customer database come to the fore. Competing lottery ticket suppliers Tatts Group (TTS) and Lottoland both took strategic stakes in the company and Jumbo shut down its loss making business in Germany. Had Jumbo management showed more nous in the Tatts negotiations, shareholders could have ended the year much better off. As it is, the returns are not to be sniffed at. Other industrial companies to contribute meaningfully to performance included Reckon (RKN), NZME (NZM) and Dicker Data (DDR). Reckon’s share price simply retraced the losses of the previous year. We are unimpressed with the company’s progress despite the share price improvement. NZME is a well managed business that has its fair share of problems. We wouldn’t be surprised to see corporate interest in it over the course of 2018. And Dicker Data, perhaps the lowest maintenance stock in the portfolio, continues on its merry way growing profits and paying them all out as fully franked dividends. Perhaps the biggest difference between this portfolio and most other similar funds, however, was its substantial allocation to mining and mining services businesses. After several years of frustration and pain, these stocks delivered the goods in 2017. Including the losses on Hughes Drilling and Logicamms, mining-related stocks collectively delivered more than 12% of portfolio performance during the year. The gains were widespread thanks to surging commodity prices and a return of confidence and money to the sector. Cardno (CDD), GR Engineering (GNG) and South32 (S32) each delivered between 2% and 3% to the portfolio and MACA (MLD) added further to last year’s gains before being sold in September 2016. Despite a poor year operationally, the big winner was Macmahon Holdings (MAH). Losses on a contract at Newcrest’s (NCM) Telfer mine will wipe out all of the improvement elsewhere in Macmahon’s business and shareholders will be left with nothing to show for 2017. The share price rose 88%, though, and we think the decision to reject CIMIC’s (CIM) bid for the company in January this year was the right one. While shareholders have lost a year’s profits thanks to past management errors, they have gained a new CEO in Mick Finnegan who looks to be the right person to resurrect this perennial underperformer. With a large contract book and plenty of seemingly attractive opportunities in the pipeline, it would not surprise us to see Macmahon top the performance list again next year. As a final note to this year’s performance report, we encourage all investors to temper their expectations. 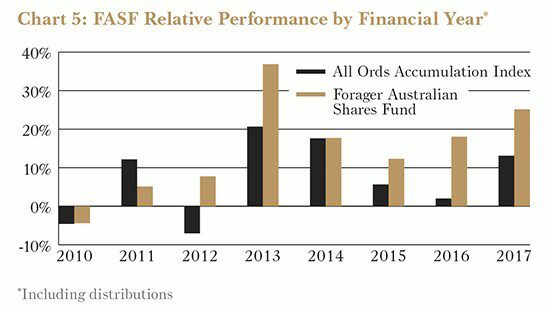 It has been an extraordinary six-year period for the Forager Australian Shares Fund. Our aim is to continue outperforming the market – and that is what you pay us to do. We warned investors from the start, however, that returns are likely to be lumpy. Don’t let the past six years lull you into thinking any different.